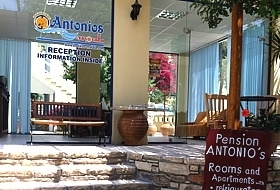 In the middle of Matala, less than 200 m away from the beach with its famous caves, Apartments Antonios are situated in a quiet back road - directly at the starting point of the worthwhile hike over to wonderful Red Beach. Despite this centrality, the treasured and fondly planted shady patio offers an ideal place to relax. 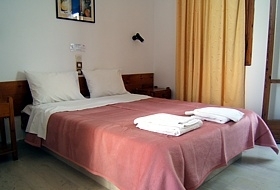 Antonios and his son Manolis carry on this family run business with 5 double rooms and 5 studios (2-5 pers. 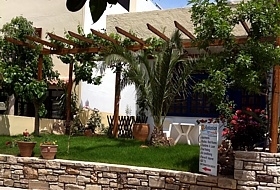 ), all furnished in traditional Cretan style and equipped with bathroom (shower/WC), fridge and phone each (extra baby cot possible). Room cleaning is provided daily, air condition is available without any extra fee. Breakfast has to be booked separately. You can take it in the friendly common room or under superb bougainvillaea trees in the patio. Parking place is put as guests disposal right behind Apts. Antonios!